﻿ Opinion: Who can claim victory after the Trump-Kim summit? This week’s milestone handshake in Singapore. Picture via Twitter. Despite fears and upsets, the long-awaited Trump-Kim summit came. 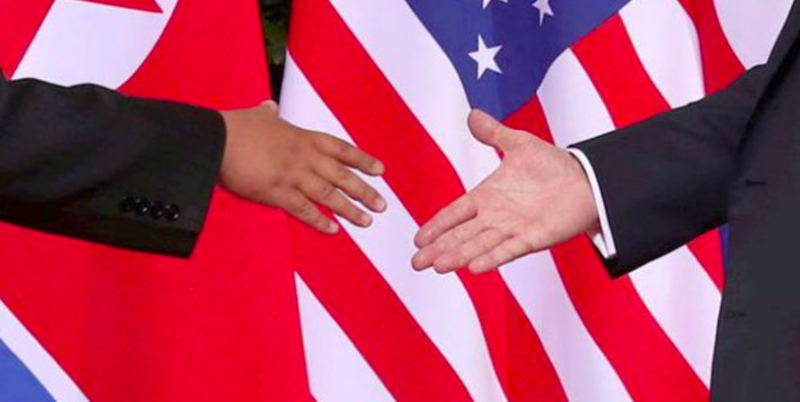 The world gazed as two serving leaders of North Korea and the United States met together for the first time in history. Much to be expected, they spoke of only hope and peace; they produced a joint statement which affirmed in aspiration, a path to ending to the mutual hostilities which have plagued the countries for nearly 70 years. If implemented, the Korean War would be to officially end and North Korea would engage in the process of denuclearisation. Similar to the meeting with Moon Jae-in the previous month, many observers responded with optimism and celebration, not least the supporters of Trump. While there is of course an undeniable prospect that better relations between the US and North Korea can emerge from this summit, as well as a much-welcomed turn away from confrontation, in practice and in terms of substance, the event was in fact underwhelming and in essence, may yet prove self-defeating for Trump. Today was a little more than a case of “The President’s New Clothes” tailored astutely by Kim. Except neither him nor his supporters realise this. Any observer of American politics and foreign policy must be eagle eyed to note the fact that Donald Trump is a man who deliberately and unashamedly exaggerates his own achievements in everything he does, even if it means a resort to outright lies. Despite the sheer transparency of many his statements and claims, he is incredibly good at setting and controlling narratives by placing himself at the centre of attention at all times and all places, while utilising highly simple, yet effective phrases, buzzwords and names to subtly influence people’s perceptions. North Korea has been no exception. While the administration in many areas did increase meaningful pressure on Pyongyang, in many senses a more careful look beneath the of “maximum pressure” and “fire and fury” revealed the reality was in some areas clouded by his theatrics. The impact of sanctions were, in some areas, grossly exaggerated. The narrative that Kim had come begging cap in hand to trump desperate for mercy, was false and designated for the audience of his own support. One which was repeated by his aides, again, again and again. The key point? Trump exaggerates his success and the summit was no deviation to that. In substance, what we received was an aspirational pledge which was not even as substantial as the agreement signed in Panmunjom a month ago. While it is fair to note that Trump attempted to be reasonable and pragmatic, given the difference in expectations have been so huge between both sides, even to the point of it nearly falling apart, the lack of substance does it even less justice the silence on “how” it ought to be brought about. A more ironic slant is that the “terrible” Iran deal that Trump binned actually had concrete steps of commitment, process, action and verification, all which were fulfilled, the agreement at Singapore contained no such things. It talked of a potential “denuclearisation” without any substantial content as to how and when it ought to be achieved, setting no binding conditions whatsoever. In this sense, despite Trump endlessly talking up himself, the outcome was an enormous backtrack from the very expectations he had set. Kim obtained his long-cherished summit without having to surrender anything upfront. It has long been his objective to improve and normalise relations with Washington on terms strictly favourable to himself. This was the true end goal of all those years’ worth of nuclear and missile testing. It’s been obtained quite easily. While we should give scope to the idea Kim may deliver some meaningful or surprise concessions to keep the diplomatic momentum ticking, let us not assume he is so short-sighted to acquiesce faith and trust in the United States. America changes, its leadership changes, its priorities change and cannot in a democracy, be so consistent. Only behind Trump’s back stand a mob of angry congressmen and Democrats criticising the summit for its lack of teeth, demanding more obstacles and concessions before diplomatic normalisation should can tolerated. Kim could act in good faith and cooperate, only to find he’s gave up all his leverage and the next presidential administration easily slaps sanctions on him for Human rights abuses, then what? What do they have left? They are not naïve, just look at how fast Trump tore up Obama’s legacy. North Korea does not think in terms of high pressure electoral cycles, it thinks about 10 years, 20 years. Kim aspires to rule for life, his picture is bigger than the quick “wins” of Trump. He can wait this out. Talks will continue, shows of goodwill will continue and Kim will continue his breakout from economic and diplomatic isolation. What the Trump administration fail to grasp is that Kim is not desperate for “help” from them. American aid would be nice, but he has more options. China has been lifting sanctions since April, and it even had the courage to officially announce that today. Other countries will follow suit, in particular Russia and many throughout Africa and Southeast Asia, all which give little heed to UN measures, save when military tensions are high. When this is considered, you can see Kim isn’t really desperate at all. He has everything he wants and, contrary to Trump’s self-delusions, owes nothing to him. In this sense the only tangible result of this summit is a weakening of the American position, an exposure of Trump’s snake-oil tactics and the blatant absence of a clear, long term strategy beyond his “transactional diplomacy” which may prove costly, all of which Trump and his followers would be seething over were it the actions of his predecessor. Tom Fowdy is a postgraduate student of Chinese studies at Oxford University. In 2015 he founded Visit North Korea, which promotes travel, cultural exchanges and human engagement with the country. Jeez. It takes him 3 paragraphs to un-mask his never-Trump viewpoints. I want my 1/2 a minute back!